Very pretty. Sums up the countryside in summer. my thoughts exactly, love the clours, and envy your life style!! Wow! That is very pretty. Gorgeous picture, I love poppies! That's breathtaking, bet it was even more amazing for real. Great shot. 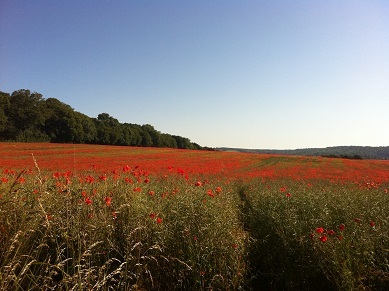 Yes, poppies are my favourite flower, and it is breathtaking in real life. Sarah - it is stunning in summer. Great that your mum has a boat! It's such a lazy quiet way to see the countryside. Oh wow that's simply beautiful! A perfect scene from the English countryside. Beautiful. These are the fields that I dream of walking through. Stunning! Like Monet's field of poppies. Beautiful. Looks like they go on forever there. beautiful love poppies, stunning. thanks for sharing. What a beautiful poppy field. Was great to meet you last week at cybermummy. Cannot think of a word strong enough to match this beautiful scene. Poignant too when think of connection between poppies and blood.